Dogtime salutes Arkansas’s PAWS of Marion. Marion residents, Emily and Buddy Kaiser founded PAWS in 1993. The original focus of PAWS was to raise money and in-kind donations for the city shelter. Over the years, that focus changed based on the needs of the community. Today PAWS’ primary focus is now rescuing, rehabilitating and re-homing at-risk dogs within the Marion, Arkansas, community. PAWS (People for Animal Welfare Society) is a 501c3 non-profit organization comprised of a few volunteers dedicated to making a difference in the lives of abandoned, neglected, and abused dogs in our community. Our mission is to give ALL DOGS, no matter what the ailment, injury, or circumstance they may find themselves, in a fighting chance. Our volunteers work to save dogs in danger of euthanasia from our local municipal shelter (the Marion Animal Shelter) and also assist abandoned and unwanted dogs that are in need within our area. Many of the dogs in our rescue are literally picked up off the streets by PAWS volunteers. Once a dog comes into our rescue, ideally, he/she goes to a foster home until a permanent placement is found. We never have enough foster space – so occassionally we are forced to board a dog until a foster home opens up. While in our care – the dog receives general vetting and any additional medical care he/she needs. Very few of the dogs that come to us have ever seen a vet – many are in poor physical condition and/or injured. 90% of the dogs over 12 months who come to us test positive for heartworm disease and must be treated prior to being adopted. We try our best to adopt dogs out locally – but due to the overpopulation challenge in our area, there are limited adoptive homes available. 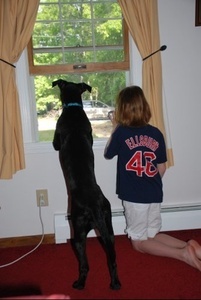 We are fortunate to have partnerships with several quality rescue groups in New England. As a result of these partnerships, many of our dogs travel North to new homes via PETS transport (www.petsllc.net). Brady represents one of the the worst cases of animal abuse that we have seen. Brady had his ears cut off by his previous owners to make him look mean, but when things went wrong they left Brady to bleed to death. 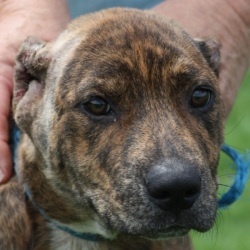 Luckily for Brady, he was found in time and rushed to the vet, where the remaining parts of his ears had to be removed. Brady’s ear surgeries cost almost $400. With his neuter, vaccines, and heartworm test, Brady’s total vet expenses were over $500. Even though Brady was so badly abused he absolutely adores people. It is amazing how forgiving of human nature these unwanted and abused dogs can be. 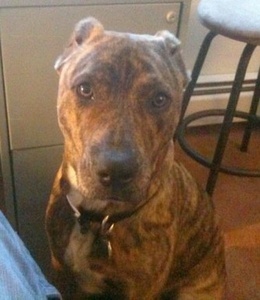 After Brady had recovered we were afraid no one would want him being a bully breed, and one without ears to boot! One of our rescue partners took a chance on him and in no time he had found his forever home. With his new family, Brady has completed two obedience classes and received his Canine Good Citizen certificate. Brady is now enrolled in clicker training and will be trying out his skill at agility as well. Brady’s story is a testament of how every dog deserves a second chance. 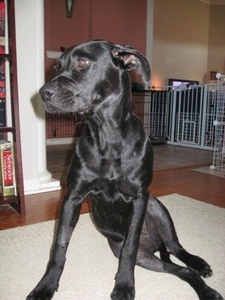 Ivy is a black Lab mix who was run over by a car. She crawled up on a woman’s doorstep one night and just wagged her tail. She suffered all night long before she was able to make it to the vet. Somehow in the night, Ivy crawled under another car. In the morning, she refused to come out from under the car so volunteers jacked the vehicle up to get her out. In the process, the car spilled oil all over her. The vet discovered that Ivy broke BOTH rear legs (4 bones total). Ivy underwent three surgeries to repair her legs. Ivy’s vet expenses totaled over $2,500. Ivy’s recovery took over six months. Today, Ivy is living in a wonderful forever home and is able to run like the wind! Everyone that meets her is absolutely amazed with how sweet she is, despite having suffered so much trauma and pain.